7. Electrical connection and associated operating parameters – i.e. three phase motors can be connected in a ‘star’ (Υ) or ‘delta’ (Δ) configuration. In a star configuration the current flowing from the supply is reduced as is the torque. 9. Efficiency class – IEC nameplates quote EFF ratings at full load. It is a measure of how well the motor converts electrical energy to mechanical power. 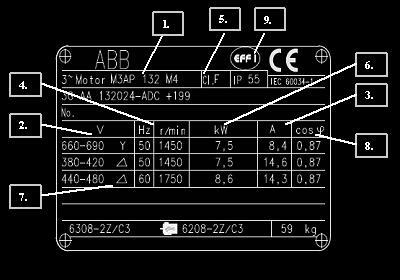 The information displayed on a motor nameplate may vary depending on manufacturer and motor size. Srpm = synchronous revolutions per minute. Example: What is the synchronous of a motor having 4 poles connected to a 60 hz power supply?